THE NATURAL HAVEN: Can baking soda or castile soap relax your hair? Can baking soda or castile soap relax your hair? No is the short answer (I don't normally cut to the chase but it is sunny today and I need to go skate in the park!!). Here is the lengthy explanation. Also we should consider other evidence. 2. Roshini of Glamazini as well as her husband are long time users of castile soap and they have a lot of beautiful natural hair between them. (Yes I know she is on the hunt for shampoo now but castile soap has certainly done no harm to her mane!). 3. Sera of Sera252 mentioned that she cleaned her braids with baking soda, she is clearly natural with a full head of hair. 2. Can castile soap or baking soda use damage hair? From the previous post we know that the hair cuticle is not really perturbed by the pH range of 4-9. In my personal opinion, I do think that pH 9 is quite high and I do think it is wise to stick to the mild acid to neutral range (i.e 5-7). However, it does appear that hair is pretty resistant to acid or base. 3. Do castile soap or baking soda remove silicone? Non water soluble silicones are pretty hard to remove. There is research on use of SLS but not soap or baking soda. This is because soap is not considered a sophisticated ingredient (yes really scientists do say this). SLS actually does not entirely rid a surface of silicone but will remove the vast majority of it. Soap does dissolve oil and probably will to some extent dissolve silicones but SLS does it better. Baking soda is known as a scourer (i.e scratch clean) rather than an oil dissolver, so I do not think it would be effective (Please note, there is no research to support this, it is my scientific opinion). 4. Should you switch to shampoo? I am a huge proponent of manufactured products specifically shampoo and conditioner (especially from companies who actually have research labs). Ultimately I think that everyone has to work with what they are comfortable with and if you prefer shampoo bars or castile soap or baking soda and have had no problems so far, then there is no issue with sticking to what you like. I hope this series helps those of you who wanted these questions answered. I hope you can also find a happy medium with your product choices...........I'm off to skate! Thank you for posting this very helpful information. With all of the products available and the sometimes conflicting information out there on what to use or what not to use on natural hair, it does indeed help to have reliable, researched data to assist in making choices. I do tend to stick to what works best for my hair. To get to this point, though, there was a lot of trial and error. I've heard of folk cleaning hair with vinegar... not sure of the dilution formula. Does that work? Why?? Why are you a huge proponent of manufactured products? Thanks for the info (as usual)! Eli- Shampoo and conditioner specifically are two of the best researched hair products. They are based on a mix of manufactured and natural products eliciting the best of both worlds. There is continual research into these two products specifically meaning formulations improve year after year. CHM- I don't think so but I will look that up too since I don't know. Science does not really acknowledge 'hairdresser's porosity'. Hairdresser's porosity is usually defined as the spaces between the cuticle layers which determine how much water gets into the hair. Scientific porosity is damage i.e holes and chips in the hair surface. Hairdresser's porosity sometimes will include scientific porosity. Therefore the science available by and large does not talk about porosity except in reference to damage. The reason being that everyone's cuticle will allow some water through and large differences are only noted when there is damage to the cuticle. If hair is not bleached or color treated, the variance in water uptake is minimal. That said, I will check it up for you, my feeling would be if castile soap could do this then shampoo surely would do too because it has more efficient surfactants. It seems to me that it does has an impact on the hair because why will so many people feel their hair is softer when they use it and even think it relaxes the hair. I agree it does not relaxe the hair we we stick to the definition of what a relaxer is but something seems to happen. Would castile soap be efficient enough to use after swimming? Are there any ways to make sure the chlorine is out of your hair? Thank you for addressing this question. We need more scientists like you evaluating these myths and stating the facts. It amazes me what becomes "fact" on youtube and hair forums, including this myth. Thanks again! Kadiane - I do agree that high pH is not ideal but I do not think it relaxes hair. Sometimes I do think people feel like hair feels softer because they have mixed the baking soda with conditioner and kept it on overnight. Would the hair not feel softer with just conditioner alone? Some people who have done the conditioner mix report a burning sensation meaning that this mix is potentially damaging skin and possibly hair. In short I am not an advocate of it. Mysskay - I think it may, chlorine removal is usually by replacement meaning thoroughly rinsing the hair with tap water (around 15minutes). After this rinse, Washing with soap or shampoo is recommended. However if you coat your hair with a barrier of silicone or other oil prior to swimming, you may want to use shampoo. Loo - Your welcome:). I do agree we need more scientists so that we can have more discussion of these issues! I also appreciate your journal references and science background. There are definitely a few youtubers giving misguided information on pH and its effects on hair. It's amazing that a few slick videos set to a nice soundtrack allow erroneous information to run rampant regarding this topic. I have read that the high amount if keratin in hair makes it "hard." I am wondering if there is a substance that serves to work with the keratin in the hair shaft to soften it (not relax it), so that my hair stays shiny, springy, and cottony, but without the sticky build-up.. I love my type 4 coily thick hair, but I want it to look great AND be touchable. Well she did say ph balance wasn't her forte in the comments. She can say that again. That's why I've stop listening to her when it comes to science. I'll just watch for the hair styles. Everyone should just leave the science to JC here, lolz. I actually think Kimmaytube did a good job on the pH series videos especially since she is a non scientist. The vast majority of it was good and accurate. I think the only key fault was a bit of an exaggeration on the effects of pH based on information from books which do not site sources. However keeping hair in the mild acidic to neutral range is good advice as is using pH strips (when used correctly). If she was a scientist I would judge her more harshly but because she is not, I would say that she did an excellent job. I agree, she did do a good job but I think she sort of exaggerated as well, and now that you think about it, that scientist she quoted didn't cite a source. It just seem by the way she had her series, it seem like you shouldn't use anything above the 5.5 range, which includes baking soda. I'm glad she was actually sort of wrong, because baking soda REALLY helps when it comes to cleaning my scalp. Phew, glad to know I can use it again. I really like a clean scalp. ha. But see, that's just it, she isn't a scientist. If you know you not an expert, or even somewhat knowledgeable on a certain subject, why talk about it? That's like converting to Buddhism on a whim and then teaching others about it. Yeah sure, you'll hit some, but you'll also miss some, and maybe even on an important issue. It's the blind leading the blind, any way you slice it. That's why you leave stuff like that to the professionals. They know the religion better than a newbie. You can really do some spiritual damage. That's why people go though years of training, anybody just can't do this and that, or TEACH this or that. Personally, If I don't know jack squat about a subject, then I keep my mouth closed, respectively. I know it will come and bit me in the end if I don't. I not trying to be rude, just trying to understand why anyone would try and teach people a subject they don't know anything about. What sense does that make? I know she's passionate about hair, we all are, hence why we follow your blog, but, Come on, did she really think she could read a few books and be fit to teach? I am a scientist as well, and I think Kimmaytube has done a great job compared to many group thinkers on youtube. She gets a little help from her husband who's a scientist of some sort. She's one of the people I still visit from time to time. Many hair bloggers and youtubers were frustrating me, not so much because they recommended not using certain ingredients, but because they did no REAL research as to why. Many were just hopping on the bandwagon. I thought for a while I was being overly sensitive because I do research, but clearly some people do care enough to dig a little deeper. I'm so glad you started this blog. A few of my natural colleges and I were thinking of doing the same just to stop some myths, or at least give people the options to chosen why to go for one over the other. Keep up the good work. You've gained another follower. Addy, skating was fun. I didn't fall over this time! I do agree 5.5 is not the limit. There is a broad 'safe' range. Anon - I understand your point of view. I think that natural hair has forced people to become experts in their own hair care. I think there is an issue with hair care literature because a lot of it is based on personal experience and is inherently biased. The view that many take is that this method has worked for my hair therefore it will work for yours. In reality many people do many different things and some go against the grain of thinking and still work. Thanks Niabutterfly- I do think that group thinking is really an issue with natural hair care. The second issue is people taking hearsay as a factual source of information. I would love it if other scientists also started similar blogs because there is a vacuum caused by the lack of referenced information. This leads to the build up of myths which are counterproductive to good hair care. I love your blog--I have to say that! It's like the best classroom, lol. I found diluted Castile Soap to work very well for years and actually helped define curls. But now I go with a commercial natural shampoo & conditioner because we're year round swimmers. She has done a good job in researching and becoming as knowledgeable and INFORMED as she can about hair. Most, if not all, of her videos are accurate and are a good source for the general masses that may not have a science background and are not privy to the wonderfully informative postings of JC. (You are amazing)!! I must say you are being rude. Implying that she (kimmaytube) "blindingly" leads her viewers, and inferring that she knows "nothing about hair". Clearly she has results and she has the right idea and mentality needed in the natural hair community. I am writing this because her last video, addressed this point very clearly. If you take the time to view it objectively, you will see that she certainly isn't part of the problem in the natural hair community. In her videos she insists that viewers do more research and really learn about their hair. To question and find out the purpose of certain practices, the benefits of products, and to not follow a fad just based on hearsay. She completely acknowledges the science. It may not be as in depth as JC, but she is certainly heading down the right train of thought. It is great that she is attempting to become knowledgeable and start getting into research. And since she does have a following, finding the most reputable information at her disposal (books and articles) is key to prevent her from just "blindingly" leading her viewers. She is anything but blind. She probably has the most informative and creative hair videos on Youtube. Whenever I do meet someone interested in natural hair, I direct them to two sites: kimmaytube and of course, the Natural Haven. Both sources are informative, (the Haven is basically the natural hair encyclopedia). Both are based on facts and attempt to debunk myths. They serve the ultimate purpose of promoting the knowledge of proper and informed natural hair care. Between these two sites, I have confidence that natural hair movement will flourish and prosper. Aaaannnd I'm jumping off my soap box. lol Judy, thanks for your comment and compliments.I am happy that you put your point across too. I welcome all opinions, a healthy debate is always useful. Thanks Cristiana-I would love to be a year round swimmer but wet hair and UK winters just do not go together! I am not being rude and you don't know my motives. Thank you. Geez, can anyone criticize anyone without being seen as rude? It was an honest observation. Calm down. I never said she was a problem. Can you tell me where I said that? She is somewhat "blind." It takes years of research to teach. You can't teach certain subject without a degree in many fields. That may take several years if not a decade. Prove me wrong. And I never said she was intentionally misleading people. Noble are her intentions but let's call a spade a spade, and don't put words in my mouth. It's petty. Prove me wrong when I said she exaggerated? Prove me wrong when I say she isn't a scientist and have only read a few books with shady sources? Prove me wrong. Yes, she "attempted" and she got some things wrong. What's to defend? She's human. Can she never fail? Well she did. I subscribed (and still am) to her when she first came out, and I mean when she first came out. Kimmay is grown, she can defend herself. She doesn't need you to defend her (but I can't stop you.) Let her take the responsibility. It won't kill her if people hold her accountable. In fact, it makes on better, deny it if you must. I personally, will not hold my tongue. Lastly, guess what? I send people her way as well. I just tell them to take what she says with a grain of salt. Seriously, why can't people question what's she done now? She gonna make a mistake and if people don't tell her how is she supposed to fix it? How is she supposed to better herself? People who are your friends would tell you when you messed up. Jerks won't, they'll let you make a complete arse of yourself. Then what happens to the "so-called" friend? They get question on why you didn't tell them! I know, it's happened to me. Please, tell me when I'm wrong. I don't want to look like an idiot. I only have one request if you do, tell me in private. Let me calm this down a little (Jc tries to generate instant smiles by passing out virtual cocktails and truffles). I do just want to say that I will not accept any more comments about Kimmaytube or her work. I think we have all bases covered so far from detractors to middle ground to lovers. She is very much entitled to do her own spin on hair topics as she understands them. The post really is about castile soap and pH, so comments on this are welcome. After having read this and the reference articles, I'm still not quite clear on pH and relaxers, and this has been on my mind for a long time. So time ago, a post was circulating on the LHCF (and still is) with a long list of relaxers and their corresponding pH. I used to use Phytospecific Index #2 and eventually #1 on my 4A (little bit of 4b)hair. This was one of the first things recommended to me when I first found the forum 4 years ago, so I switched immediately. The list claims the Phyto #1 has a pH of 9. The post states some of the info came from manufacturers so I cannot attest to the accuracy, but something was drastically different about this relaxer for my hair because I no longer lost CLUMPS of hair when relaxing and neutralizing. Although my hair was ravaged when I found the forum, at its healthiest and loveliest it didn't grow much past shoulder length; after Phyto my hair almost reached my waist. I know I learned a lot of other things to maintain my hair, but if I had continued with my previous no-lye regular relaxer I know I would not have had the same results. I always assumed the lower pH was what made such a huge difference. Now I'm totally confused by your posts. LOL Is it not possible that this product could have a pH of 9 and still straighten my 4a hair, let alone any hair? The active ingredient in the inductor appears to be guanidine carbonate. I guess I could mix some up and test for myself now that I know about pH strips; however, I'm 8 months post, and with this humidity my transition would cease to become a natural reality. LOL Do you have any knowledge of this relaxer? If so, could you please enlighten me??? Hi Lavendar. I don't pay specific attention to relaxers in this blog. Let me clarify that relaxers work not just because of pH but also because of concentration. There has to be sufficient amount of the chemical to cause realignment of the fibrils in hair. I would suggest that you go to the relaxer post (which is linked in this article above) and see how relaxers work. In my opinion the change is most likely to come from the concentration of the chemical (in your case guanidine). 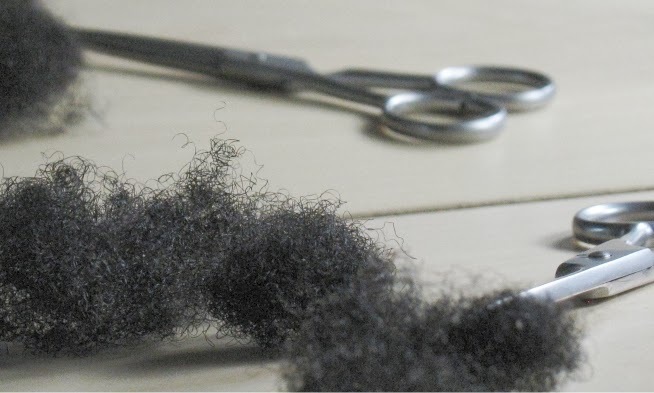 The cortex of your hair is responsible of strength and if you are reporting losing clumps of hair immediately when relaxing then the relaxer you were previously using was probably of a greater concentration than your hair required and damaged that cortex more than it should to straighten hair. Some people experience the same thing with switching from lye to no lye and vice versa. Is a lower pH better, definitely but it is not the single reason why hair is relaxed. As I said at the top, relaxing is a combination of pH, bond breaking and permanent realignment. Absolutely clear now! With all these videos and post lately about the pH of this and that, it all starts to run together and either seems conflicting or gets confusing. I now realize this was kinda OT, but I really appreciate you explaining this more in depth for me.